Three decades after allotting land to the hunter-gatherer community of Ogiek in Mau forest, the Kenyan government has asked them to leave. The 2,500 Ogiek families have been asked to surrender their title deeds by October. The move, Prime Minister Raila Odinga said, was made to save the country's largest catchment area. Located in the heart of Kenya's Rift Valley, Mau is the catchment area of 12 rivers that feed waterbodies across eastern Africa, including Lake Victoria, and support five million people. 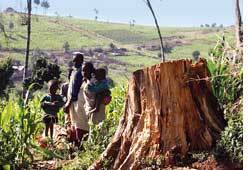 Green groups say the forest has lost a quarter of its 400,000 hectares (ha) in recent years due to unchecked settlement, illegal logging and burning of charcoal. The impact is evident in the drying of rivers. A recent government report said the degradation of Mau started in the 1980s when the then President Daniel arap Moi moved the Ogiek community from the heart of the forest and resettled them on the outskirts. 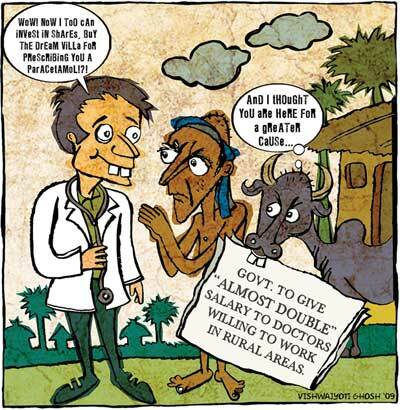 He offered each family 20 ha. But during the process those handling the resettling allotted thousands of hectares to themselves and other influential people who eventually pushed back the forest to establish commercial farms, ranches and tea estates. The Philippine government halved the price of 21 essential drugs. Acting on a government study that found drugs are sold in the Philippines for four to five times the price in other countries, the government had appealed pharma companies to bring down the prices. The companies though agreed to reduce the price of 16 drugs, they refused to do so for amlodipine, atorvastatin, azithromycin, cytarbine and doxorubicin--drugs used for treating high blood pressure, cholesterol and cancer. Following this, President Gloria Macapagal Arroya issued an executive order capping drug prices. A third of Filipinos lives on US 85 cents a day, government statstics indicate. The pharma association estimates it will lose up to US $208 million in sales a year. One of the least reported undercurrents of the climate change negotiations is trade protectionism. The fear escalated during negotiations on the EU climate package when French President Nicolas Sarkozy suggested levying carbon tariffs on the imports from countries that oppose binding greenhouse gas targets at the UN climate talks in Copenhagen in December. Sweden's environment minister, Andreas Carlgren, whose country holds the rotating EU presidency, recently called a meeting to reject any such measures. "The threat of taxes to harm developing countries would seriously make the negotiations more difficult," said Carlgren. German state secretary for environment Matthias Machnig termed the French idea a form of eco-imperialism and a direct violation of wto rules. Developing countries such as India and China oppose the idea of carbon tariffs. After 16 years of legal wrangle, the Wiks, an Aboriginal clan in Australia's Queensland state, have been granted access to their ancestral land. Citing anthropological records, the federal court said the Wiks are the traditional owners of the Cape York peninsula.Since a portion of the land has been leased to Rio Tinto for bauxite mining, the court ordered the mining giant to compensate the aborigines and to consult the community before building any infrastructure in the future. 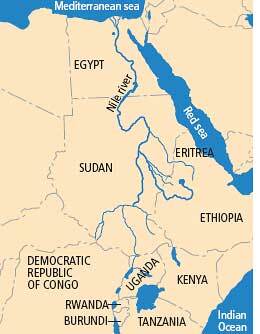 Hopes that the 10 Nile basin countries would sign an agreement securing equitable share of the world's longest river have been dashed after Egypt refused any cuts in its historic quotas. The riparian countries met in Alexandria, Egypt, to sign a cooperative framework deal. Though downstream, Egypt is the largest consumer of Nile water. A 1929 agreement signed with Britain, which at the time was acting on behalf of its eastern African colonies, had given Cairo the right to veto projects on the Nile that would affect the river flow. In 1959, it signed a pact with Sudan, which has the largest basin area, securing 87 per cent of the total annual average flow of the Nile. This riled the other basin countries who want changes in the pacts. Though the resentment has been brewing for years now, with the growing need to set up hydropower projects by upstream countries, the feud is intensifying. If junk food leads to obesity, why not reduce the size of candy bars, juices and sodas and help people reduce their calorie intake? The UK Food Standards Agency has called for suggestions on this line to tackle the country's growing health problem. By 2012, it wants chocolate-based snacks such as Mars bars and Snickers to be no larger than 50g compared to the current 58g. Choc-olate bars should weigh no more than 40g and cans of fizzy drinks should be cut from 330ml to 250ml by 2015, it recommended. The agency also called for confectioners to reduce the amount of saturated fat and sugar in biscuits, cakes, pastries and soft drinks. Studies predict that on current trends 60 per cent of UK's population will be obese by 2050. China closed a chemical plant after thousands of residents in central Hunan province took to the streets alleging pollution from the plant killed two people and sickened hundreds of others. Health checkup of 3,000 people living in the vicinity of the Xianghe Chemical factory, which produced zinc sulphate, revealed more than 500 people had high levels of cadmium, a carcinogenic heavy metal. The authorities suspended two environmental officers and detained the plant head. Residents said they had petitioned for an investigation of the plant in 2007, but the provincial government had failed to take action. Several Mapuche communities, indigenous people of Chile and Argentina, have begun to reclaim their traditional land in the Araucania region in central Chile. The reclamation began on July 23, two weeks after the government refused to talk about their rights; the Mapuche make up about 4 per cent of Chile's population. On July 23 hundreds of Mapuche tribals took over properties, including the land of a logging company, and set up roadblocks. The territories belong to the indigenous people, they said. The clash is part of an ongoing dispute between the government and the Mapuche who demand the constitutional recognition of their identity, culture and ownership of the land that belonged to their ancestors. 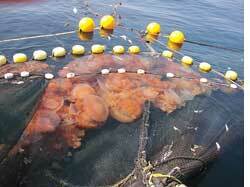 Giant poisonous jellyfish are poised to assault the Japanese waters. Researchers from Hiroshima University found unusually high numbers of Nomura's jellyfish are spawning in the Yellow and East China Seas and are moving towards Japan. They are expected to hit the country by mid-August, warned the researchers. Nomura's jellyfish is one of the largest jellyfish species in the world, which can grow up to two metres wide and weigh 200 kg. Their huge bodies damage fishing nets, poison the catches and often sting fishers. Japan usually experiences such invasion once in 40 years. But it has become frequent in recent years, said the researchers; the last invasion was in 2005. One of the factors could be the decline of the jellyfish's natural predators, such as sea turtles and fish that eat them when they're still young, said the researchers.